Sign up for Google AdSense via Docstoc is another alternative way to register google adsense. If you feel the toil and trouble in the process of registering the google adsense, then it means that you can try this one, simply by uploading some original documents in your possession, then do a little settings then you can publish google ads and earn additional income and your adsense account. Wanna approved by Adsense easier? may be the reason for some people to sign up via Docstoc. One third parties (third party) that can be used to register the Google Adsense is Docstoc.com. 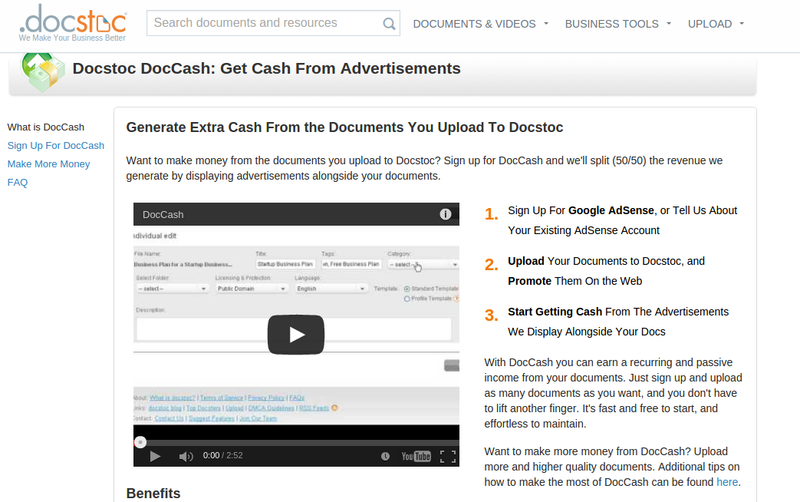 Docstoc is a document or file storage service (file) online are also willing to share revenue with its members through Adsense or through direct sales document if the user follows DocCash program. Here are the stages in the register google adsense through docstoc, please listened well, hopefully it can help you as well. Create an account first, if you don't already have one. It's so easy to register. If your docstoc account has been created, the next step is upload your multiple documents has become your docstoc account. Tip: upload your document a minimum 5 articles or files, English would be much better. Once the upload is completed docstoc documents and settings are done, then you click the link above to your account settings. The next step is to sign up DocCash on your docstoc account, the way is click the Sign Up For DocCash found on the top right corner of the website. Afterwards you will be directed to input the email address that you created earlier docstoc account list. There will be two options that I already have a Google AdSense account and I do not have a Google AdSense account. Please help me get one. Please choose the second option then enter your email and click the Get My Google AdSense Account. Tip: We recommend using a google email account so that the registration process can be much more effective and efficient. After sign up DocAsh then open your email thus check it out, you will get a confirmation email, click the confirmation, you connect to the website in google adsense fill its forms, and there is an option that asks you to choose whether to approve your adsense account can be accessed by Docstoc, in this option you select We approve google adsense account can be accessed by Docstoc. Until receiving this email, to register google adsense step via docstoc still unfinished. Then complete your docstoc account so that the process can be much faster registers and that the registration process can be approved adsense account more quickly. Tip: docstoc account and complete your profile to 100%, the more complete the greater your chances of being accepted into the Google AdSense pulisher. After all the steps above you do well, then you have to wait a few days for your google adsense account activation. So first tutorial adsense through docstoc list, hopefully you can add to your knowledge about google adsense account registration.